Football - Brighouse Town v Whitton Albion. Daniel Facey for Town. 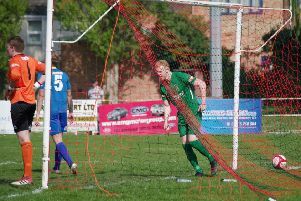 A 24th minute strike from Daniel Facey - his second winning goal in successive games- saw Brighouse Town complete a double over Scarborough Athletic at Bridlington last night. Town were 2-1 winners at home over the Seadogs on January 2 and heaped more misery on the east coast club’s new manager Steve Kittirck, who is still to win in four matches. Brighouse were making it two 1-0 wins in four days in the NPL after Saturday’s success over Radcliffe Borough and should have won more convincingly. Skipper Leon Henry blasted wide with the goal at his mercy 90 seconds after Facey’s goal. Tom Robinson hit the bar a minute after the break from a corner and Sam Hewitt might have had a couple of goals. There was a late scare for the visitors when, in the fifth minute of added time, James Pollard cleared off the line for the second match running. Brighouse are up to ninth in Division One North and have a chance to make further progress when they host Bamber Bridge, who are 14th, on Saturday. However, Bridge will arrive in good heart after making it three wins out of four with a 5-0 home win over Harrogate Railway last night.